Regular readers of this publication (there are at least three or four of you, which is a hefty increase from the one or two who were tuning in a year ago) might be sick of hearing me extol Cape Cod. You know what? Sue me. I traipse through life under numerous aliases, so you’ll never track me down. The Outer Cape’s sand cliff-backed ocean coastline. This, then, is another story revolving around The Cape, a locale that I and my wife Sandy most favor. We find Cape Cod to carry a pretty perfect combination of attributes and personality traits. Overall it is scenically beautiful, which is why we spend much time outdoors, way more than we do back home. And, if you know where to go, you’ll find expansive and mostly undeveloped shoreline and forested and sand dune areas that are far beyond beautiful. Awe-inspiring and majestic are words I’d use to describe those sections, especially the Outer Cape’s long stretches of sand cliff-backed ocean coastline and crazily huge dunes. What’s more, Cape Cod is nicely doused with cute villages, good art galleries and museums, small theater companies and plenty of cinemas and restaurants. All of this is right up my and Sandy’s alleys. We’re at ease, wowed and highly entertained on Cape Cod. We were on Cape Cod for a spell earlier this month, based in a somewhat secluded part of Orleans, one of The Cape’s 15 townships. The Atlantic Ocean, which paws at and sometimes pounds CC’s eastern border, was near our rented house. Ditto for the endless extent of sands that goes hand-in-hand with the ocean. In other words, double duh, the beach. 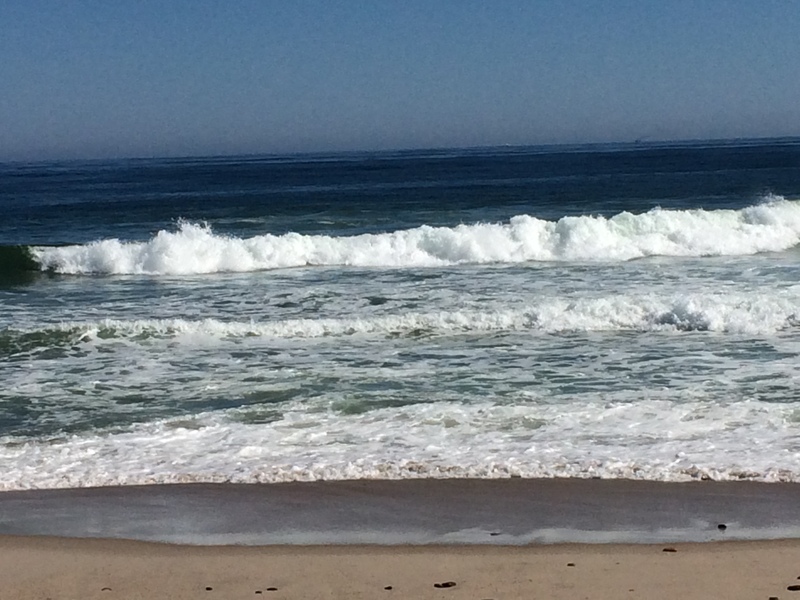 I’ve racked up many miles of hiking and strolling on Orleans’ share of the ocean beach over the years, and also on the portions within the boundaries of other Cape townships such as Wellfleet and Truro. Normally when I’m out on Cape Cod’s sands (be they beside the ocean or Cape Cod Bay or Nantucket Sound) or poking around in its forests and marshlands, I don’t particularly like seeing or being aware of fellow humans. Sandy excluded, I hasten to add. That’s because I’m a misanthrope and also because my delicate psychological relationship with Mother Nature is easily disturbed. Not to mention my delicate psychological relationship with myself. Luckily for me, normally Sandy and I don’t come in contact with many others on our expeditions. In summer, when Cape Cod swarms with frolickers, that wouldn’t be the case. But the hordes of humanity significantly diminish in the off-season, which is when Sandy and I do our Cape thing. A view from Nauset Beach. bit in its central section so that people can get their beach fixes. There’s the mandatory big parking area, the restrooms and showers, a seafood stand. And not much else, actually, besides trillions of grains of sand and trillions of gallons of H2O and millions of blades of beach grasses. No boardwalk, no amusements. Which pleases me. 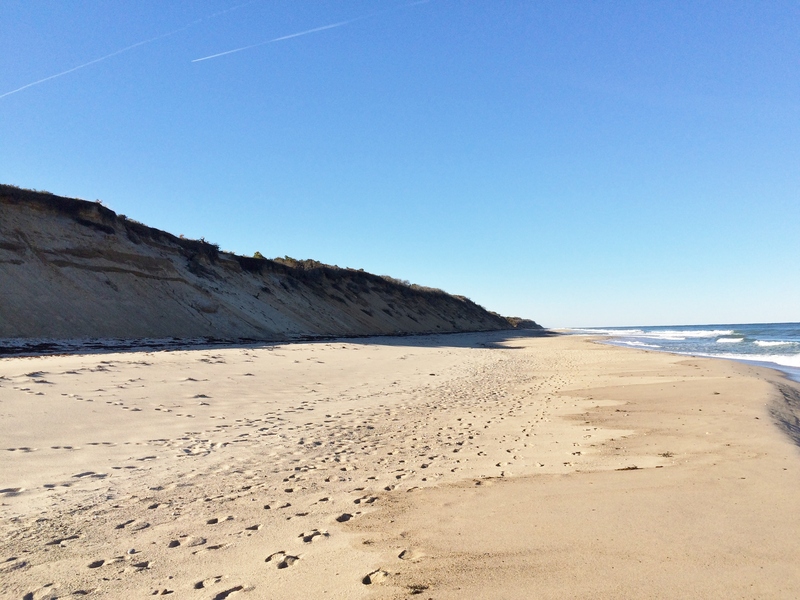 And no sand cliffs, which doesn’t, Nauset Beach being a tad south of the Outer Cape. 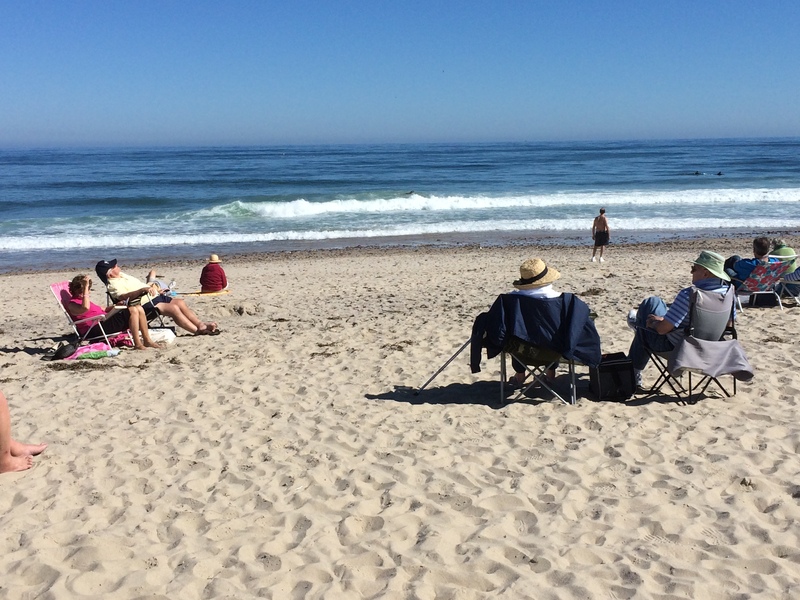 In the summer Nauset Beach is congested. Otherwise, usually not. On the Friday in question Sandy and I were surprised, but shouldn’t have been, to see quite a few vehicles in the parking lot. 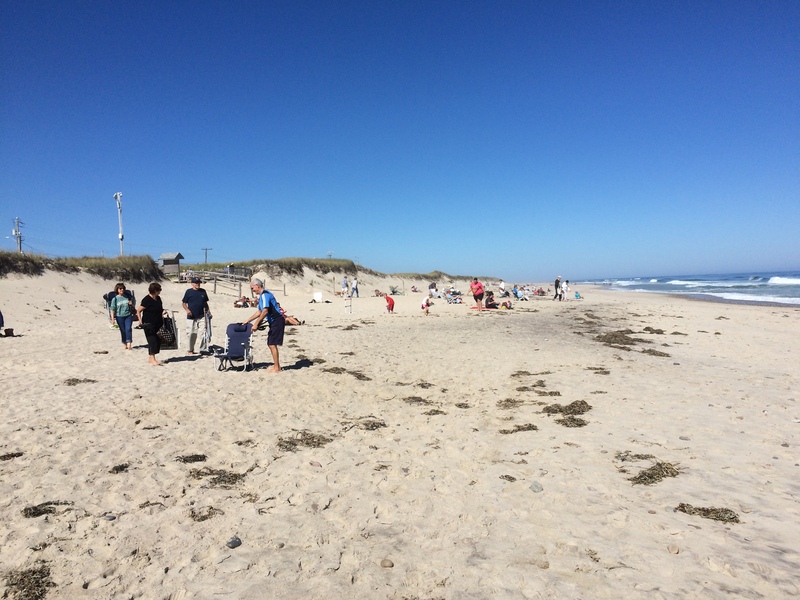 And quite a few people, hardly a mob but maybe 125 or so, scattered around Nauset Beach’s miles-long length. Hey, why not? Columbus Day weekend is a Cape draw. And the day was perfect. Mild, sunny, a light breeze coming off the waters. And, much to my amazement, I was glad to be among those folks. It happens sometimes. Everyone was calm and quiet. Small brigades of my brethren were cemented into beach chairs, staring trancelike at the ocean waves. Others practiced multitasking. Sandy and me, for instance. 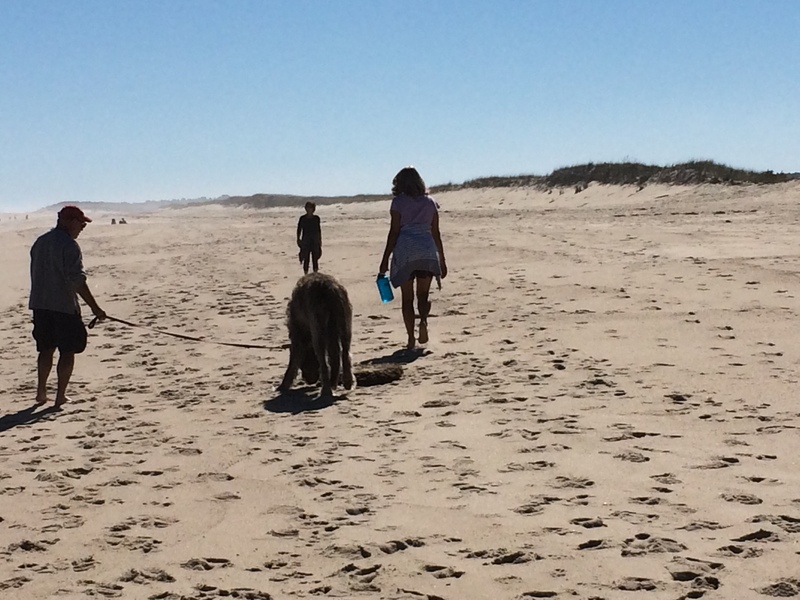 We walked the sands, gazing downward at human footprints and canine pawprints, upward at the clear blue sky and outward at the eight to ten foot waves rolling relentlessly to shore. During our journey we came across beaucoup people out for a jaunt with their canine friends. Two couples led dogs almost as large as they were. Perhaps the creatures were ponies. I’m not sure. Wait, on second thought they definitely were dogs. I heard them bark, not neigh. What is it about sand, sky and indescribably massive bodies of water that attract people like ants drawn to carelessly disposed and half-eaten Slim Jims? A few hours after leaving Nauset Beach that question came to me and, predictably, I had no bright answers. It’s quite the phenomenon, though, a natural part of human behavior as far as I can tell. Maybe it has something to do with our links to our fishy ancestors who eons ago inhabited Planet Earth’s liquid stuff. Whatever, I love staring out at Cape Cod’s waters and scampering on its shorelines. I can’t keep away. Invisible forces from within and without bring me there. It amazes me that I used to have no clue that this innate attraction was lurking inside me waiting to bloom. I found out only when Sandy and I hit The Cape for the first time in 1998. After an hour and a half of beach-meandering we headed back to our car to retrieve our picnic lunch. A gourmet meal of yogurt, grapes, pretzels and seltzer awaited us. We ate it at one of the tables outside the seafood stand and then drove off for some sightseeing in the historic core of Orleans village. The first adventure of our Cape Cod 2016 sojourn was in the books. Oh yeah? Arrgh . . . Let me outta here! I need to run free! At least some of the time. I don’t like congestion, dig? But what’s a person to do? I’ve written a few times online about the sweet spot that Cape Cod occupies in at least two hearts, mine and my wife Sandy’s. Cape Cod is where we head when we want to get away from it all. Not that Cape Cod is free from congestion. Hardly. But if you know where on the Cape to go, and when, you’ll be far far far from the madding crowd and its cars and trucks. And you’ll have fun too. Cape Cod is famed for the throngs that descend upon it between Memorial Day and Labor Day weekends. People and cars up the wazoo. That’s why Sandy and I never go there during that period. We were on the Cape last month though, when things were back to normal. We spent plenty of time among others of our species. But we also made sure on most days to bathe our souls in places where the human and vehicular factors would be minimal. Parabolic sand dunes territory. Truro, Cape Cod. “You know,” I said to Sandy on this most recent trip as we stood atop a humungous sand dune. “If you plopped most people down here and asked them where they were, they’d never guess it’s Cape Cod.” That was true. When the majority of folks think Cape Cod they envision seaside-ey villages and seafood-ey restaurants. But we were miles away from any of that. We were in parabolic sand dunes country, inland just a bit from the Atlantic Ocean in Truro. Truro is a sprawling area of the Outer Cape, and probably the most rural and desolate section that Cape Cod has to offer. 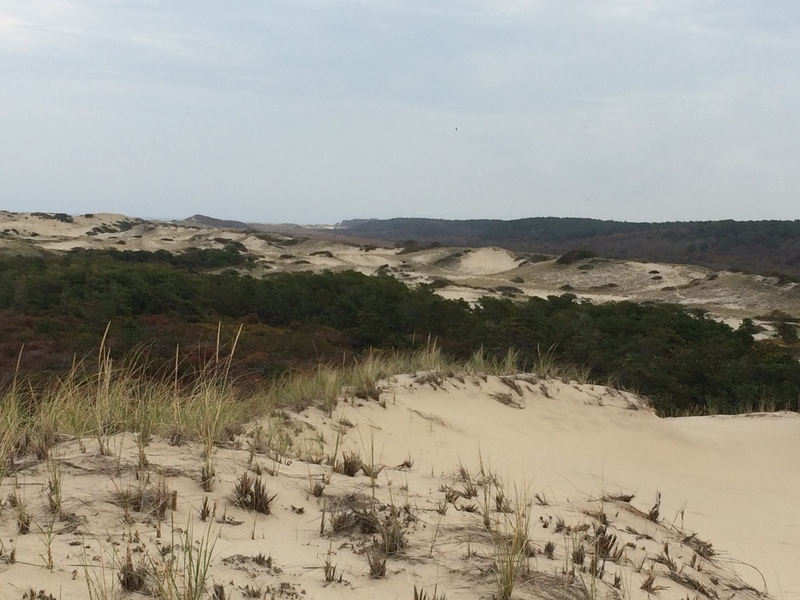 The parabolic dunes are by far the Cape’s biggest, undulating 80-feet-and-taller monsters that extend for several miles, covering part of Truro and of Provincetown too. We’d been in this locale a bunch of times before, and as always were knocked out by the vistas. Several parallel chains of dunes ran long into the distance. Between each chain were deep valleys that, surprisingly to me, a low level naturalist, were loaded with small trees and shrubbery and all manner of other plants that I couldn’t give names to. This is a mind-blowing environment, a vegetated lunar-like landscape that, I’m sure, many Cape Cod residents and vacationers barely know about. It is open and wild. I feel alive there. And that’s why I like it. Over the years I’ve spent a lot of hours scampering up, down and around the parabolic dunes, and even more among the slightly smaller and less dramatic dunes that take over in Provincetown when the parabolic big boys eventually peter out. At this point in my life I’m not going to be climbing any mountains in the Alps or bungee jumping into canyons in the American West. For me, the Outer Cape’s dunesville does just fine as a spot where I can indulge my sense of adventure and feel as though I’m pushing my puny limits. There’s no congestion out there. You might cross paths with a few other trekkers, but that’s okay. They are kindred spirits. Dunesville is great. But what I like even better on Cape Cod is the Atlantic Ocean shoreline. Most of it is under government protection, meaning that mankind won’t be messing it up any time soon. It’s pure, it’s long — 40 or more miles — and it’s beautiful. What’s not to like? Sky, ocean, and sand-cliff-backed endless beach. Its presence of water is why I would choose, if I had to choose, this shoreline over the Outer Cape’s dunes territory. Though Sandy and I aren’t swimmers, we’re big time water admirers. 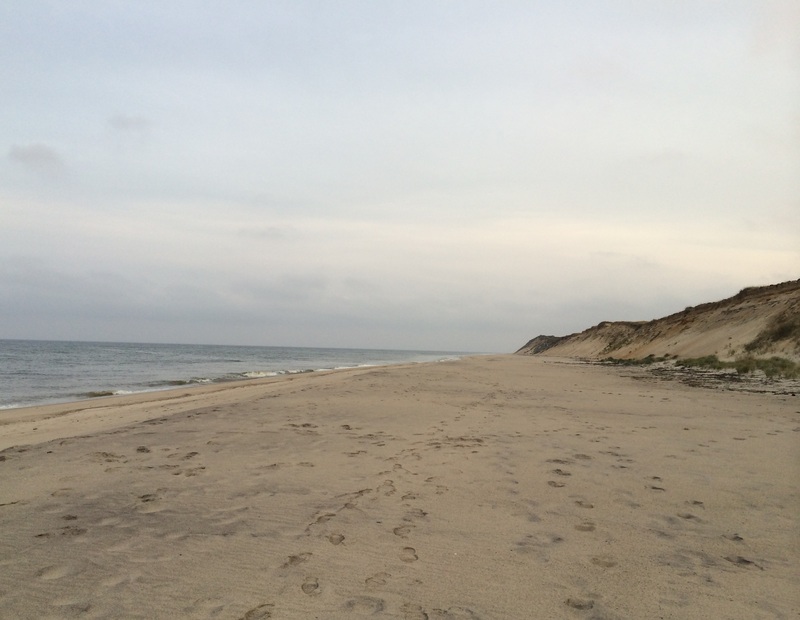 We have hiked hundreds of miles over the years on the Cape’s ocean shore. There’s just something about being there. The power of the water, its changing face from day to day. The rigid coolness of those sand cliffs. The real low numbers of humankind in the off-season. And then there’s our kite, which enhances this scenario. 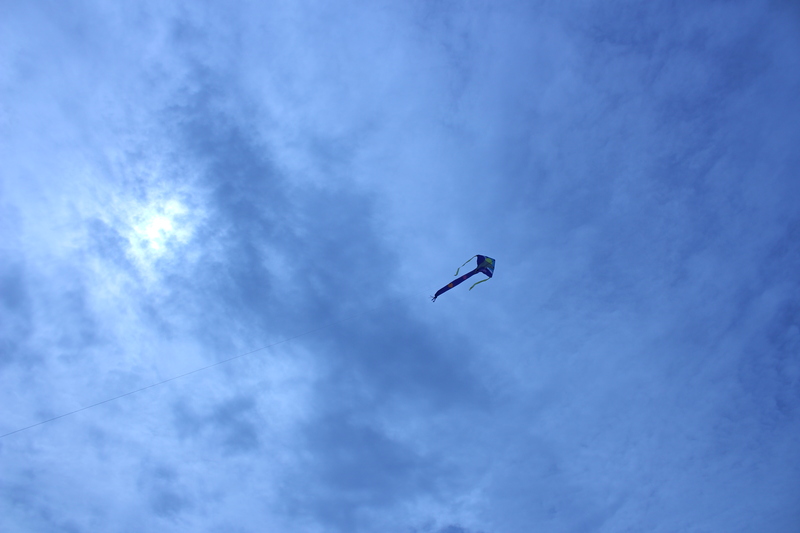 Last year we bought the kite and flew it on beaches many times. We launched it frequently during our recent stay too. Atlantic Ocean shoreline at Marconi Beach, Cape Cod. Our kite at Marconi Beach, Cape Cod. One day last month, on the ocean shoreline named Marconi Beach, the conditions for flight were perfect. A strong but not overpowering steady wind meant the kite would stay aloft sans problem. What we discovered at Marconi was that the kite was insatiable. It kept pulling on the string, begging us to let out more and more length. This hadn’t happened to us before. And so we did. The kite went higher and higher. The amount of string on the reel grew less and less. I hardly could believe it when there was no more string to release. The kite was way up there. How far away I didn’t know. After an hour or so we decided it was time to move on, to say goodbye to Marconi Beach for the day. It took a long time to reel in the kite. Later I checked out the kite manufacturer’s website where I learned that our polyester friend came equipped with 300 feet of string. I was impressed. At Marconi Beach we had overseen a long-distance journey. Congestion . . . bad. Running free . . . good. End of story.